What's to be done about iTunes? Tweak? Strip? Split? Apple killed its long-running “Single of the Week” promotion earlier this month, disappointing iTunes customers and musicians alike. After 11 years of complimentary songs, which offered exposure to countless new artists, the free ride was over—or so it seemed. But Apple on Monday launched a new “Free on iTunes” section chock full of songs and full-length TV episodes. Instead of one free song, there are 16 of them, from upcoming artists like Rogue Wave, Purity Ring, and Jessica Hernandez & The Deltas. There’s even a freebie from Guster. There are 24 TV episodes to choose from, including picks from new shows like Backstrom and 12 Monkeys. There are a slew of reality shows, like Rev Run’s Renovation and Ace of Cakes. While “Single of the Week” was available internationally, “Free on iTunes” looks like it’s U.S.-only for now. It’s also unclear how often Apple will swap out selections for fresh ones. 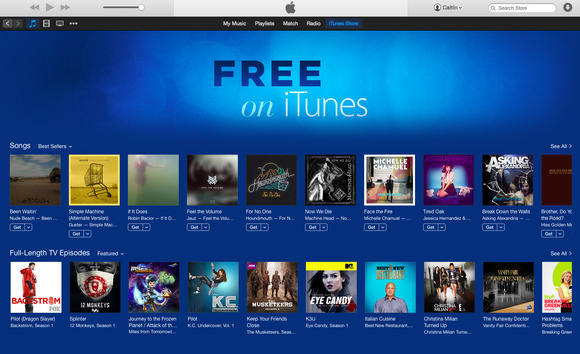 This isn’t the first time Apple has offered a “Free on iTunes” section, but this is a new effort altogether. Why this matters: Parsing Apple’s strategy when it comes to iTunes has been tricky since the Beats acquisition. Rumor has it that an iTunes reboot is in the works this year, complete with an overhaul (and rebranding) of the Beats Music streaming app. It would make sense for Apple to eventually ditch the free music promotions and instead steer listeners to Beats (which currently requires a $9.99-a-month subscription). But we’re not going to complain about free stuff—and if Apple wants to add some free books or movies to the mix, we wouldn’t be mad about it.